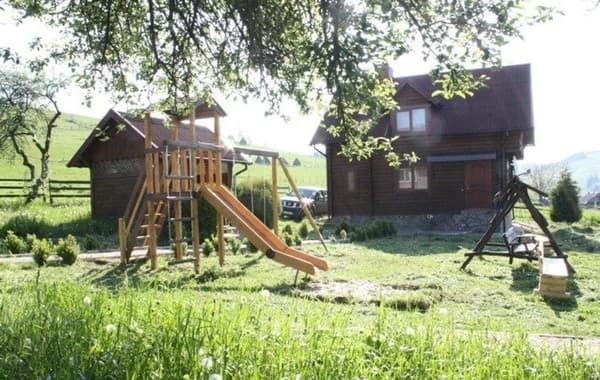 The farmstead "Perlina" is located in the village. Verkhovyna, near the central road, nearby - a ski lift and a river. All rooms are located on the 2nd floor. To services of visitors - the TV, a refrigerator, a microwave, an electric kettle, utensils, a bathroom (a washstand, a shower, a toilet, a bidet), the hair dryer, an iron. On the territory of the estate "Perlina" there is a parking lot, Wi-Fi. 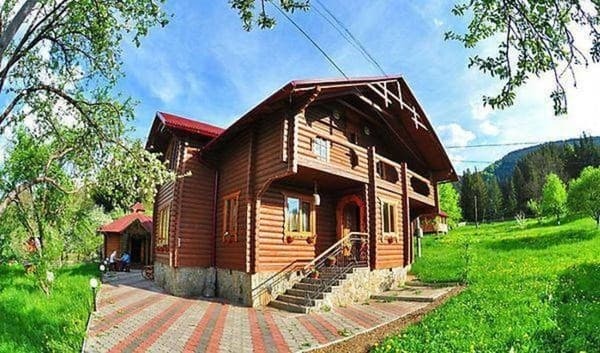 The nearest ski lift is 200 meters away, and Bukovel 65 kilometers. PRICES MAY CHANGE, YOU NEED TO UPDATE THE OPERATOR'S INFORMATION! 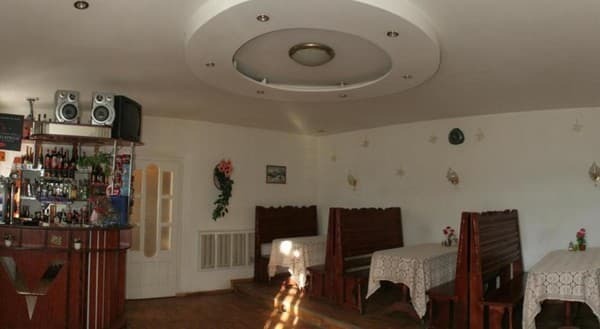 Description of the room: On the ground floor there is a kitchen-dining room, a living room with a TV, 2 bedrooms (one with a double bed, another with a sofa bed, a wardrobe), a bathroom (toilet, washbasin, shower cubicle, washing machine). 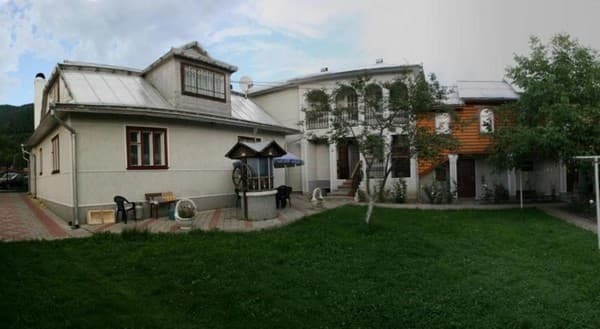 On the second floor there is a living room with a TV, 2 double rooms (a double bed, in one there is a wardrobe). Additional places - a sofa bed in the living room. 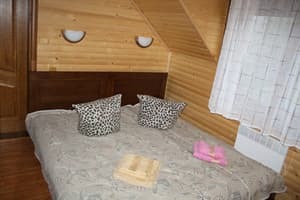 Description of the room: Wooden cottage for 8 persons (all rooms are located on the second floor). 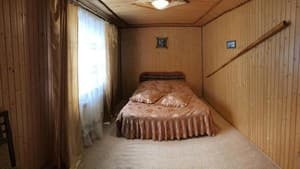 On the 2nd floor there are two double rooms (2 single beds, a wardrobe, a TV set). 2-room apartment - bedroom (double bed), living room (double sofa bed, TV, wardrobe), bathroom. For children under 6 years old, the discount is 50%. In winter, the price includes two meals a day. 1 km from the center of the village, not far from the road. 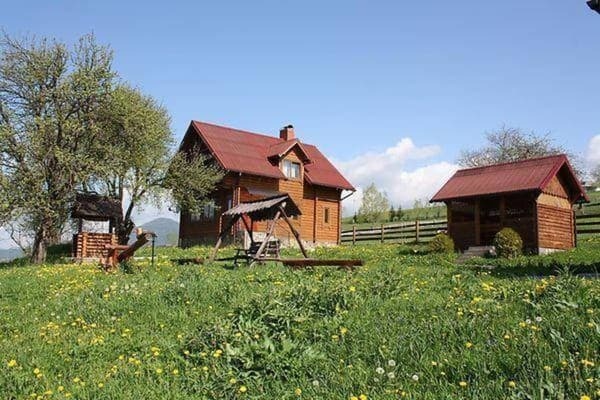 The nearest ski lift is 200 meters away, and Bukovel 65 kilometers. To Verkhovyna by bus or shuttle from Ivano-Frankivsk, get off in the center, and there the owners will meet on their car.